Nikon has launched a fifth generation model in its mid-range series of mirrorless interchangeable lens cameras. The new Nikon 1 J5 is the first Nikon hybrid to feature a back-illuminated sensor that packs a 20.8Mp resolution for stills, as well as 4K capture for video. With impressive looking performance specs too, is the Nikon 1 J5 a serious contender for the mid range hybrid market? Launched in January 2013 the Nikon 1 S1 is a new product line in the Nikon 1 Hybrid Mirrorless Interchangeable Lens series. Targeted at advanced through to expert enthusiasts after a lightweight camera for photography daytrips and holidays the Nikon 1 S1 features a clean minimalistic design. Utilizing a smaller sensor and lower resolution than most of the Hybrid competition though how will it fare in the DxOMark Sensor Scores? Released just a month after being announced at CES 2013 alongside a new lower-end sibling (the Nikon 1 S1), the new Nikon 1 J3 now takes its place as the midrange model in Nikon’s lineup of interchangeable lens compact cameras, with a list price of $599.95 (with a 10-30mm kit lens). The J3 is an update to the Nikon 1 J2, which came out only five months prior to the announcement of the J3 and S1 and had been the camera maker’s lower-end offering. Canon was the last major maker to embrace the hybrid or ‘mirrorless’ camera market. As a somewhat sober debut, designed for those who are new to photography, the EOS M adopts an 18-megapixel APS-C format in a compact body but boasts a number of advanced features including a 31-point hybrid AF system for stills and video and a touch sensitive 3-inch LCD. While it’s clear this camera doesn’t compete directly with the firm’s DSLRs, how does it stack up against the competition that don’t have the same volume of DSLR sales to protect? Nikon 1 V2 review: Evolution, stasis or regression? Launched in October 2012, the Nikon 1 V2 is a not unexpected update to the Nikon 1 V1, which debuted in September 2011. The Nikon 1 Series cameras are hybrid cameras with interchangeable lenses. In the case of the V1 and V2, they fall at the upper end of the segment, offering more features and a higher performance level than their more consumer oriented brethren, the Nikon 1 J1 and J2. Introduced in mid September, the Olympus PEN E-PM2 is the second generation of Olympus’ entry-level Micro Four Thirds hybrid camera. It sports a newly updated design with a useful, fixed grip and a touch-screen interface among other updates, but the big news is that it has inherited the sensor of the much-admired Olympus OM-D E-M5, the current top-of-the-line Micro Four Thirds camera. With the Pen E-PL5, Olympus updates its range of micro 4:3 compact hybrids with redesigned ergonomics, upgraded electronics, and especially with the integration of the same 16Mpix LiveMos sensor found in the OM-D E-M5. Will it show the same advances in image quality as the flagship camera of its line? Our tests provide the answer. 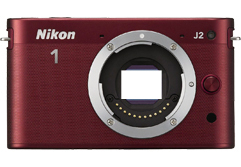 The Nikon 1 J2 retains many of the same characteristics of its older brother, the J1, including its 1", 10-Mpix CMOS sensor. Other than its new 3", 921,000-point screen, the new version of Nikon’s compact hybrid puts particular emphasis on creative modes. How does the Nikon 1 J2’s sensor perform with respect to its predecessor, to its direct competitors, and to expert-level hybrids and compacts? Some answers from DxOMark.